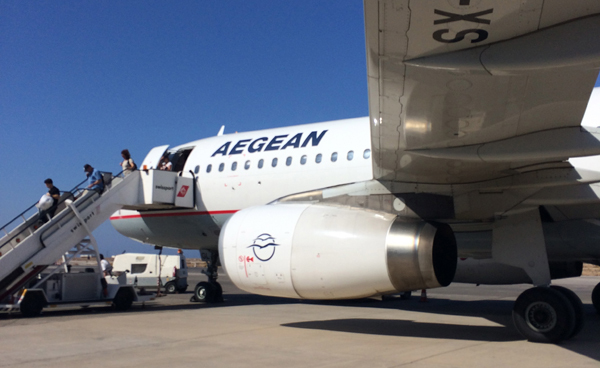 Flying to Santorini was quite the trek. 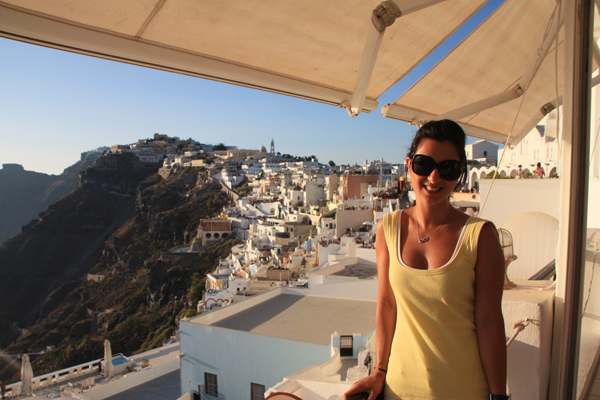 Rome to Athens, stopover, then Athens to Santorini. I did find it amusing during our stopover to listen to Americans trying to say ‘efharisto’, but instead saying ‘f-haaristooo’. I cringed and wanted to correct them but I was outnumbered, there were too many of them, not worth the effort. 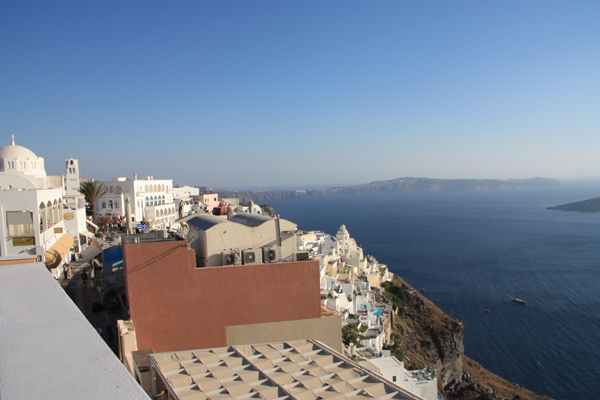 Our overpriced taxi drive did not even take us to the door, but I suppose it serves us right for getting a hotel in the little cobblestone alleys of central Fira rather than in a smaller town like Imerovigli. Nothing mattered once we got to our room and patio. The view makes everything better. It was already 6pm and we were hungry, but Argentina were about to play Belgium in the quarter finals, a game we did want to watch, Argentina had to win! So we found a nice restaurant which had tv’s and sat down, after a detour to look at the view again. Dinner was great, lots of tzatziki, greek salad, lamb and octopus. 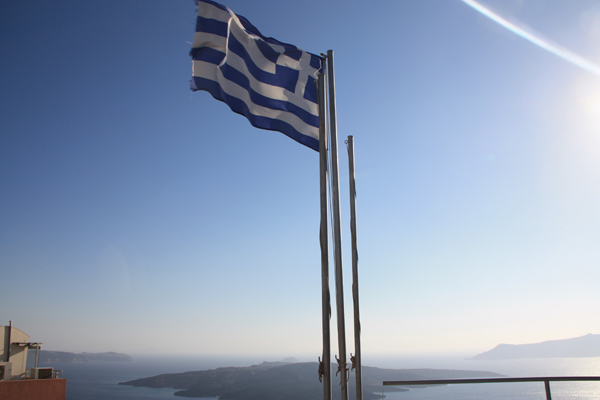 You can’t get much more Greek than that. I was exhausted after the game. Argentina won of course then we headed back to the hotel. Chris returned to the bar to watch game 2 that night while I tried to sleep. 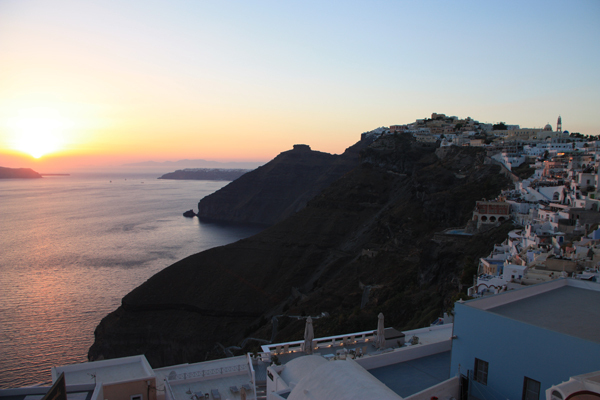 I don’t remember so much noise last time I was in Santorini, but then again I did not stay in Fira. We were in the thick of it, but so were the clubs, and what comes with clubs is their blaring music which we could hear all night and morning long. Needless to say we did not sleep that much all night. 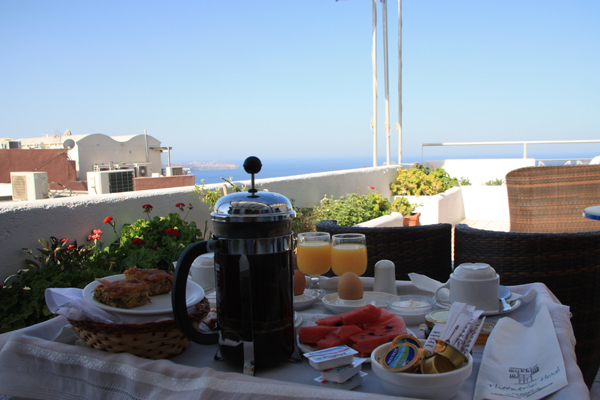 Breakfast was served on our rooftop overlooking the glistening blue sea. I was ecstatic to see a plunger of coffee as it had been a good 2 months since I had had some, our Wedding day, I made a huge pot for all the people at my house getting ready. Good thing was that it was made well, and not burnt (as I found out later on a flight serving terrible plunger coffee). We paired fresh coffee with yogurt and honey, watermelon (sooo greek), boiled eggs, bread, orange juice and apple french toast. Healthier than the big buffet breakfasts we had enjoyed up until this point which was a nice change. We spent the morning looking up our good friend trip advisor to decide on a restaurant for the evening, but in the end just took a recommendation from the hostess at the hotel. 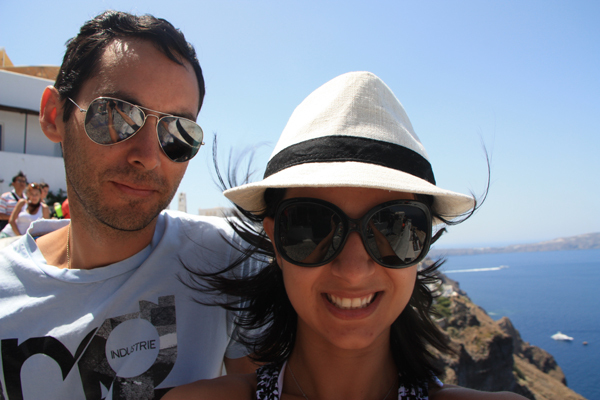 So we walked down, along the cliff face to book it in and tried to do the ‘selfie’ with the nice white buildings. FAIL. All we got is my hat and hair in the way. 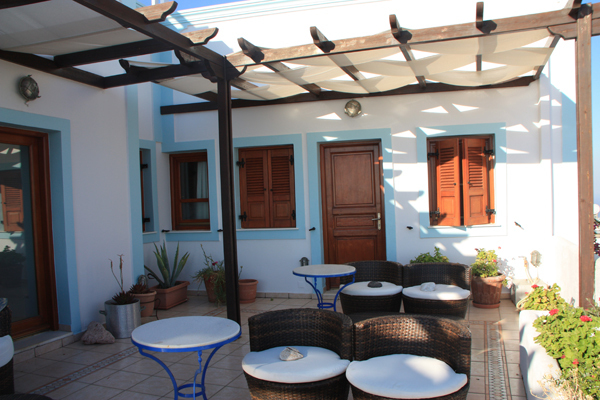 Our light breakkie was also convenient as it left room for a Gyro lunch. 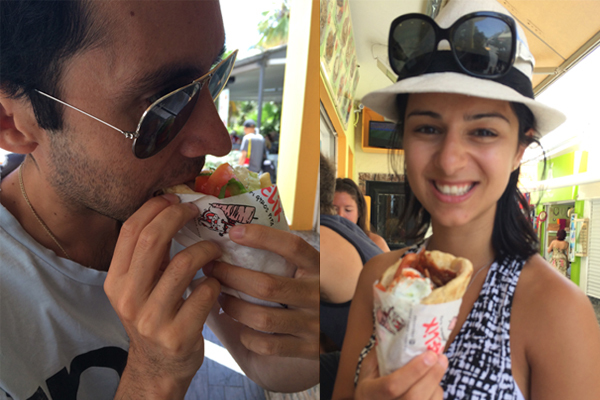 We tested both the pork and chicken gyro. YUM. 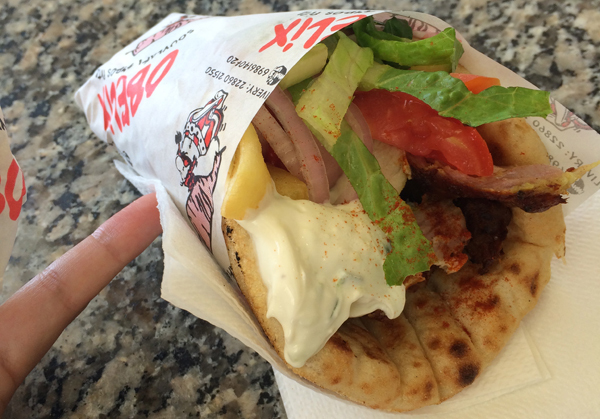 Fresh meat, salad and crispy chips smothered in tzatziki and wrapped in fluffy soft pita bread. The perfect snack before an afternoon at the beach. 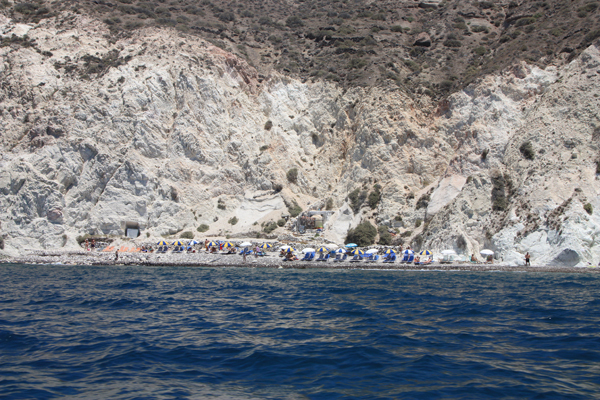 Black beach in Kamari, famous for its black gravel that spans the whole coast. We set ourselves up under a nice umbrella and it only set us back 6 euros. Compare this to the 15-25 euros they were charged in Italy and this is a steal. 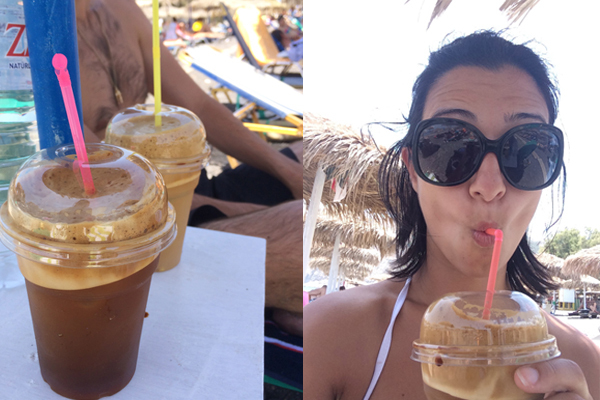 After we settled in we wanted a refreshing beverage, so I got us us frappes. Now Chris had become accustomed to this traditional Greek drink, even bordering on the point of liking it. OF course to make them last longer we topped them up with cold water once we got to the halfway point. It would be blasphemy to finish a frappe in under an hour! The water was surprisingly freezing and the wifi was not working at the beach so after a few hours we had had enough and went back to the hotel to rest before dinner. I was able to capture the beginning of the sunset as there are ledges all around our hotel, perfect for setting up a camera on timer. I do love this photo. Back to the cliff face and we were able to find someone happy to take a photo for us. The result, much better than my efforts. Lucky we booked as we were given the best table in the house. Well sort of. It did have the best view, right on the edge, but at 7:30pm when we arrived the sun was still beaming strong and there was no shade cover. I suspect other tables opted to be further back so they weren’t as hot as we were for that first hour. Almost too much sun for even me, but we held out and the results were well worth it. 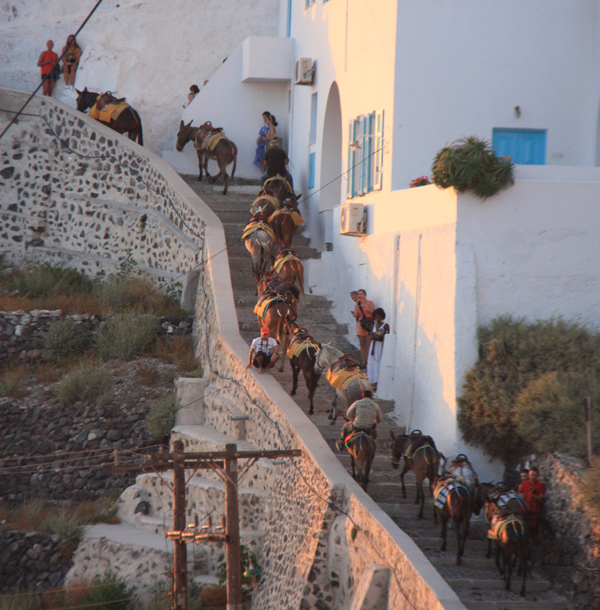 We also had a good view right along the coast and got to see packs of donkeys walking up and down the stairs. I do feel sorry for them having to carry so much so I was glad to photograph these donkeys not carrying anything at all. Right everyone get your cameras and phones out as it is starting. 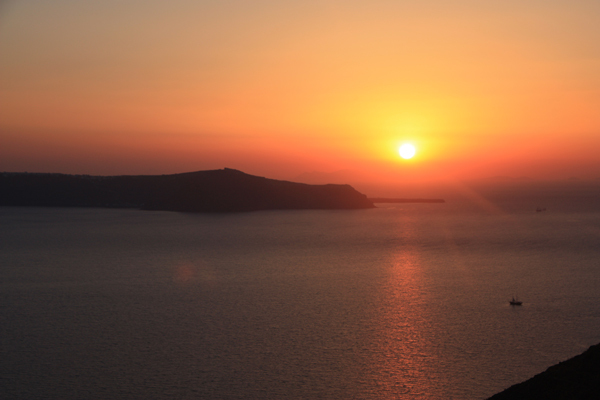 The famous Santorini Sunset. People at every restaurant along the cost were watching and celebrating. Boats were out in packs too. Once the sun did finally go down everyone clapped and cheered. A nice romantic dinner, food wasn’t great but it was about the experience. 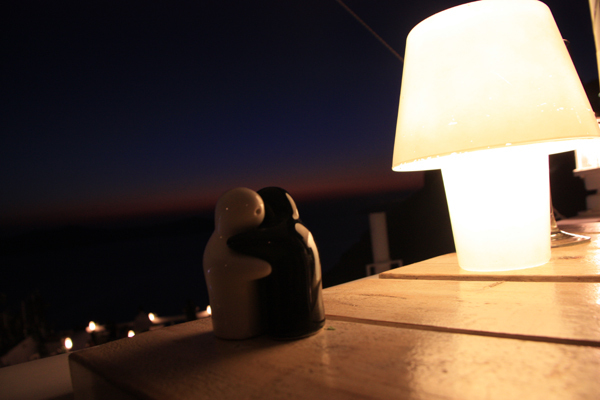 It certainly made us want to sit side by side and cuddle up while we watched the changing colours of the sky. I don’t think I could get sick of this view. 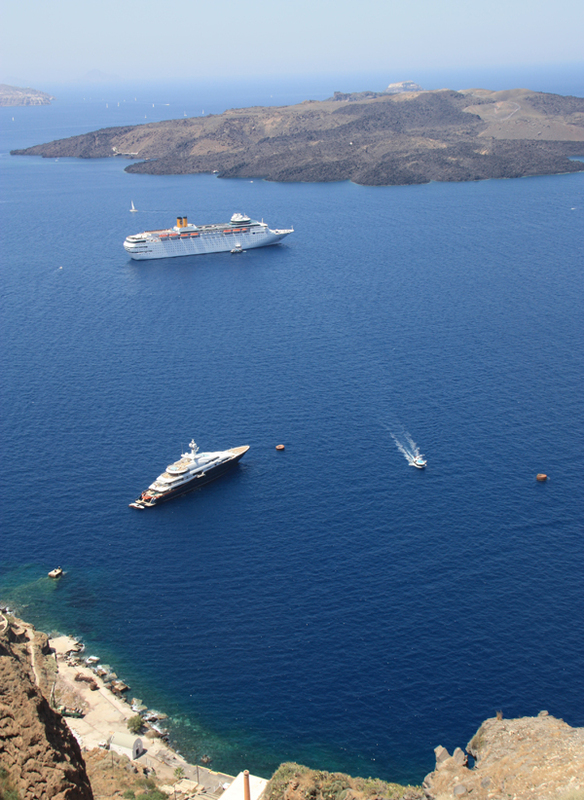 Today many more cruise liners were out and it got me thinking. What a nice way to do the islands as it is calm, you don’t need to worry about choppy high speed boats or turbulent small planes. You don’t need to wheel your luggage up the cobblestone streets and you will always have a beautiful view…..maybe one day, but not today, we still have much more land to cover. 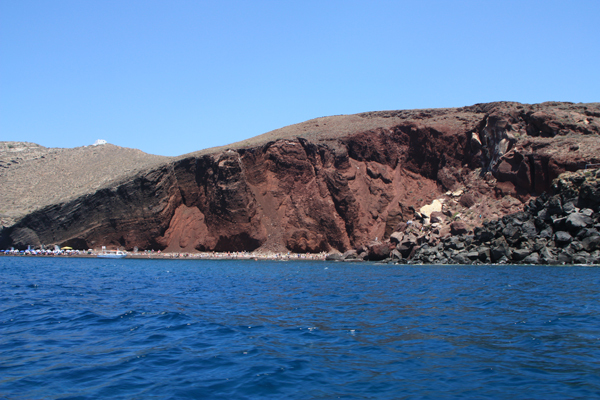 Today’s outing was to more famous beaches in Santorini, Red and White beach in Akrotiri. Incredibly they are just around the corner from each other yet they are so starkly different that you cannot believe they are from the same small bit of coast line. We caught a boat out to see the three beach options for the afternoon then could dock at whichever one we wanted. First was Red beach. I had visited before but it is always so busy and there are not many umbrellas available, let alone empty beach space. So we gave this one a miss and went onto the next beach. White beach. Such a view and like nothing we had seen before. So secluded there is no road nearby let alone any amenities. The next beach was Black beach but we had already been to a Black beach so opted for White. Plenty of umbrellas available, and because it is so secluded it is surely a monopoly, 15 euros for the both of us. Well we coughed it up as we did not want to attempt lying on the hard white pebbles. We experienced them enough getting off the boat. Since the water is shallow closer to shore the boat docked about 15m out from shore. We had to get off the boat in our cozzies and thongs and walk to shore in waist high water, with out bags on our heads and trying not to trip on the pebbles. I did save my bag, but I did trip too, it is so hard to walk on those pebbles. 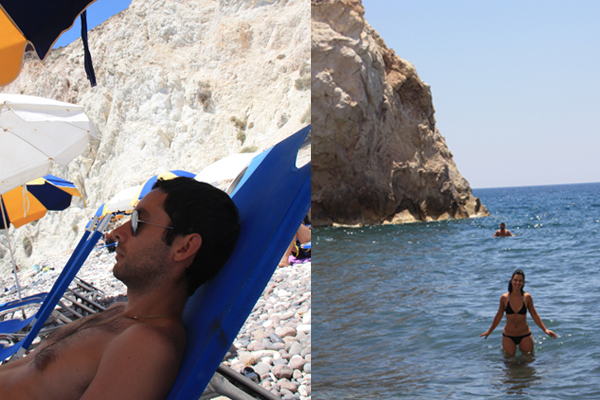 Once we were relaxing on the beach, and in the warm water, it was bliss – a quiet, calm beach with crystal clear water. Yes please! 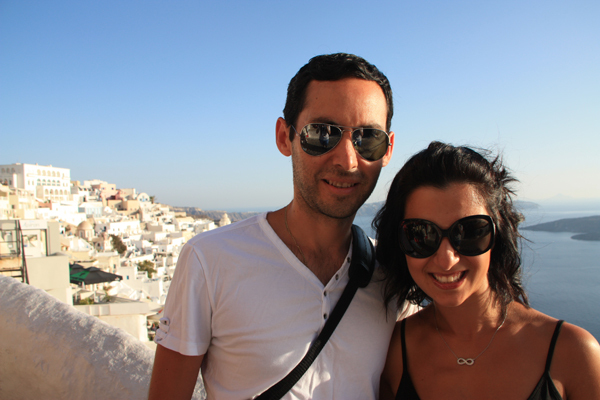 All good things must come to an end, and our last day in Santorini had so far been paradise. Back at the hotel we got the good news from the hostess that she got us a booking at her favourite traditional restaurant there, Naoussa. 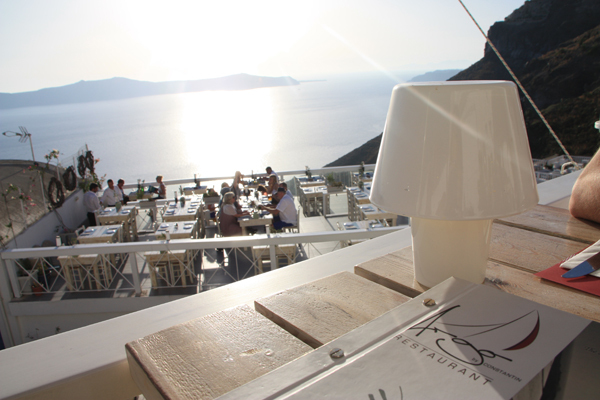 We again got the best table in the house which we felt had an even better view than what we had seen before. We were hungry so ordered big. 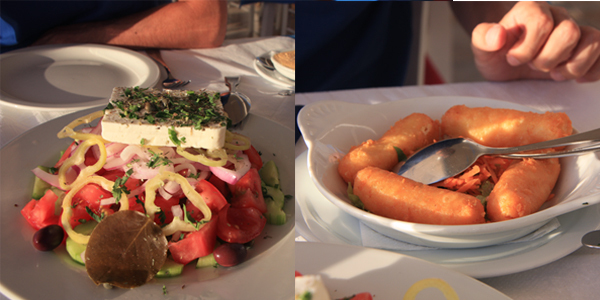 Entrée consisted of Greek salad, tzatziki and cheese croquets (which were basically just fried melted cheese). All so delicious and as I am writing this I am salivating over this meal. We washed this down with a small jug of house white wine. Mains were just as impressive. Moussaka, which I was so glad that they served in a terracotta pot. 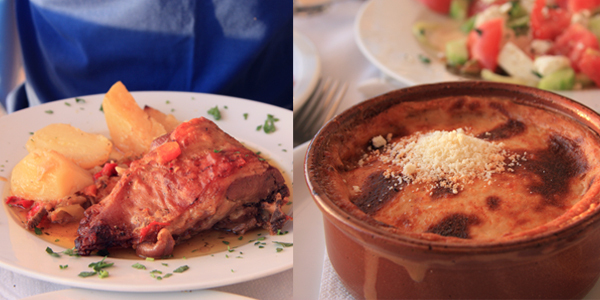 The waiter told me this was the best moussaka in Santorini and he was not lying. It was delectable. The béchamel was smooth as silk, creamy and the hint of nutmeg gives it that proper greek flavour. The meat, potato and eggplant all rich in flavour and as a whole dish YUM. Chris had slow roasted lamb with lemon potatoes which tasted good but was a tad dry, so disappointing for something that looked so impressive. The potatoes on the other hand were ‘just a-like-a home’ although would never be better than my Grandmothers, ever. But beyond my Grandmothers they were the next best. Our view. 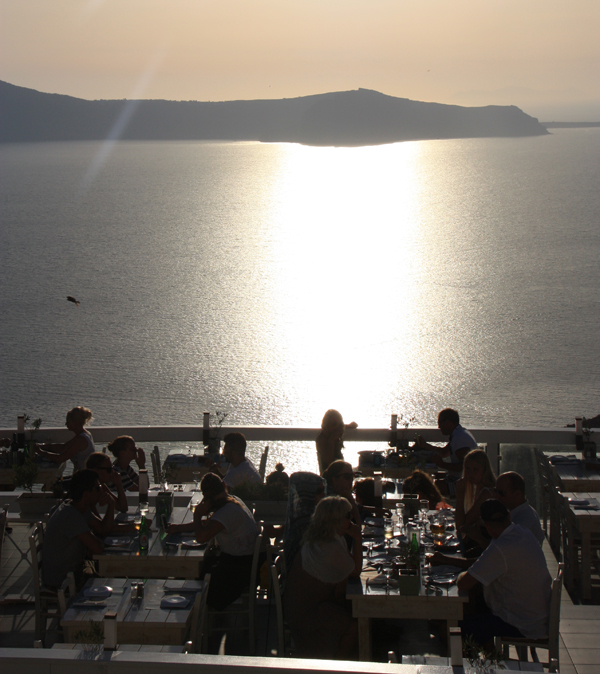 The best ending to a fantastic time in Santorini. We have seen a lot of sunsets on our trip. This would be number one, Biarritz number two, everything else does not matter. 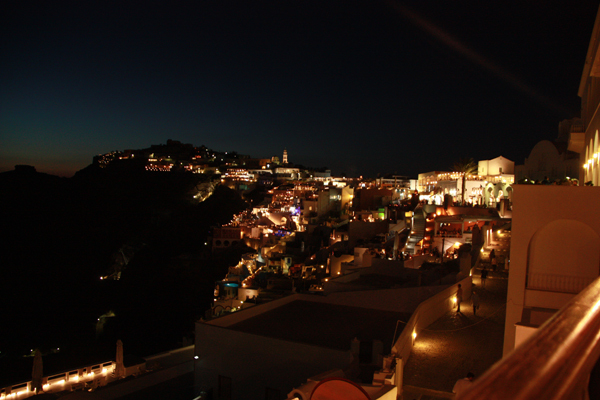 Santorini is just as beautiful when the night sky is out and the lights are on. Our time has been full of much needed relaxation and tanning. If we are coming back to Australia after 9 weeks we most certainly need a tan, what else would people come to Europe in Summer for? 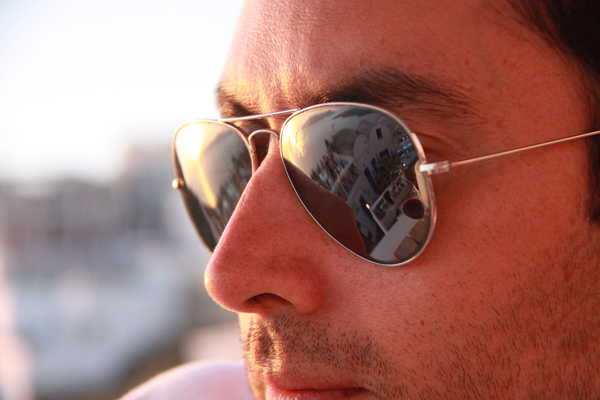 This entry was posted on July 21, 2014 by forque. It was filed under Recipes, Stories .